Home » Blog » What’s New, Pussycat? I had a productive holiday weekend – with some shopping (OK, a lot of shopping), some weaving (OK, a lot of weaving), and a new addition to the family. Also progress on some projects, and a few new ones being planned. Here is a report! First, remember the Astoria sock KAL idea, with A Hundred Ravens yarn? Everyone was so busy last month that it got lost in the shuffle a bit, and we’ve all decided this is too great a project to rush over the holidays. So, the KAL is planned for the beginning of January. This gives us time to get the patterns and yarn ready without going crazy. 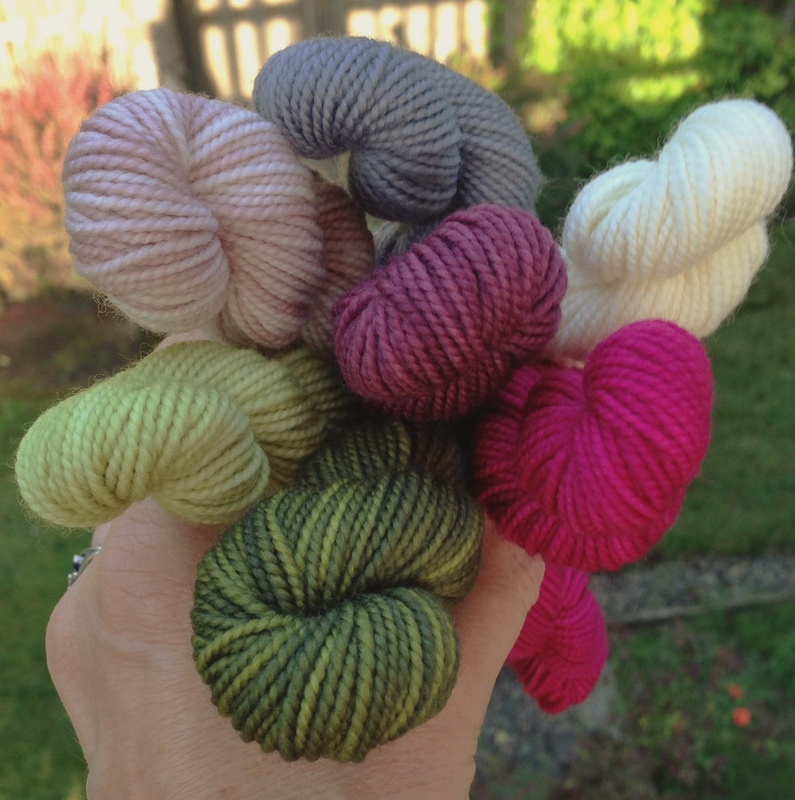 Watch this space, and our Ravelry groups (Annetarsia, A Hundred Ravens, and Dizzy Sheep) for details, and here are some photos to remind you of the beauty and fun knitting that is coming your way…. Right off the needles, not blocked but ready to wear. 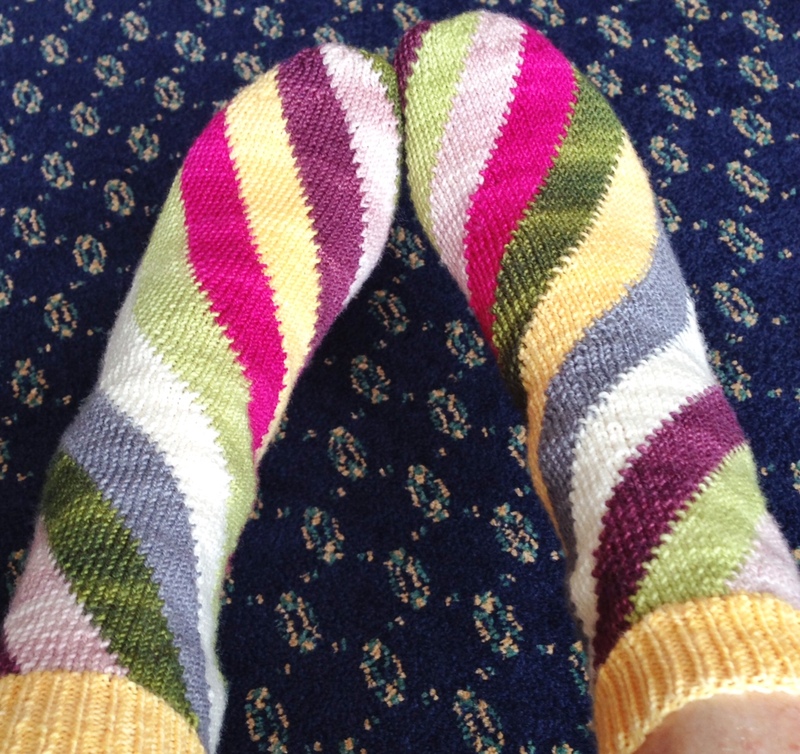 I changed the color sequence for the second sock, so they look different but coordinate. I love them so much! Kate and I plan to launch the KAL in January 2015, so watch for that! 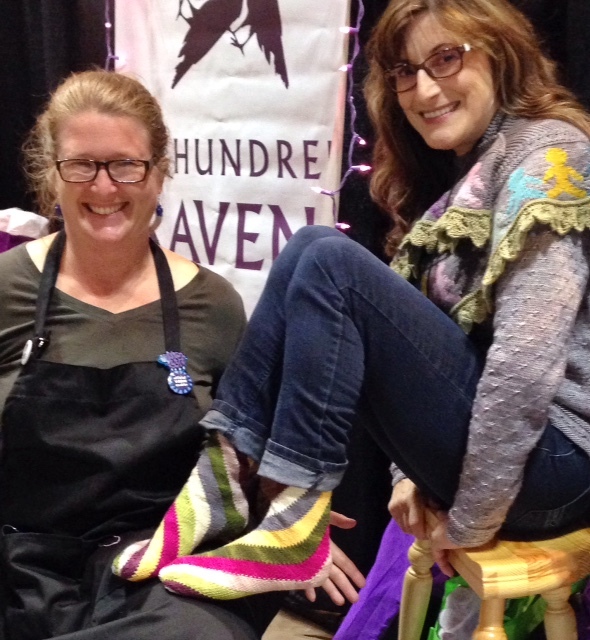 Modeling the Astoria socks in the Stitches East market, knit with the kit Kate is making with A Hundred Ravens mini-skeins. They had a wonderful booth, which was crowded during the entire event. These 7 colors will be joined by a sunny yellow, chosen by Blog readers! I took the pillows I was weaving off the Baby Wolf loom, and did a lot of the finishing, but I want to twist the fringe ends before photographing them. The twist tool has been ordered and I am waiting for delivery with anticipation. In the meantime, I am weaving Christmas gifts on the Rigid Heddle loom and planning future projects. I love weaving! Strandwanderer has been moved to the front-burner, knitting-wise. I’d like to finish it so that I could wear it before the Oregon Duck season is over. Also, I have been having the urge to knit a sweater, and ordered yarn for one this weekend (as long as I was ordering the twisty tool thingy). More on that project, later! The biggest thing to happen this weekend is also the tiniest. 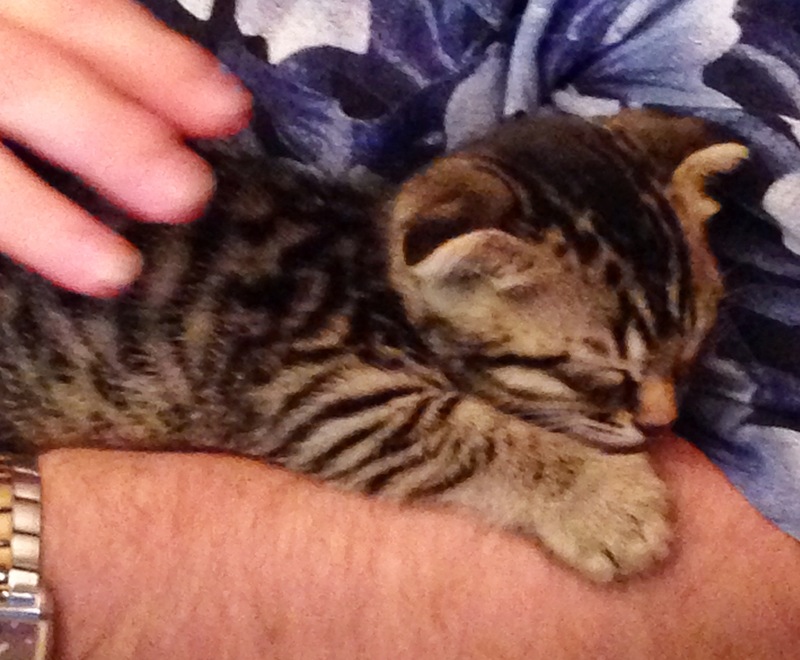 Benedict Cumbercat is an itty-bitty kitty, about 8 weeks old, and he has stolen my heart. He wants to be in the middle of everything, and loves to help me weave. We are calling him “Benny”, as his full name seems a bit majestic for the time-being. 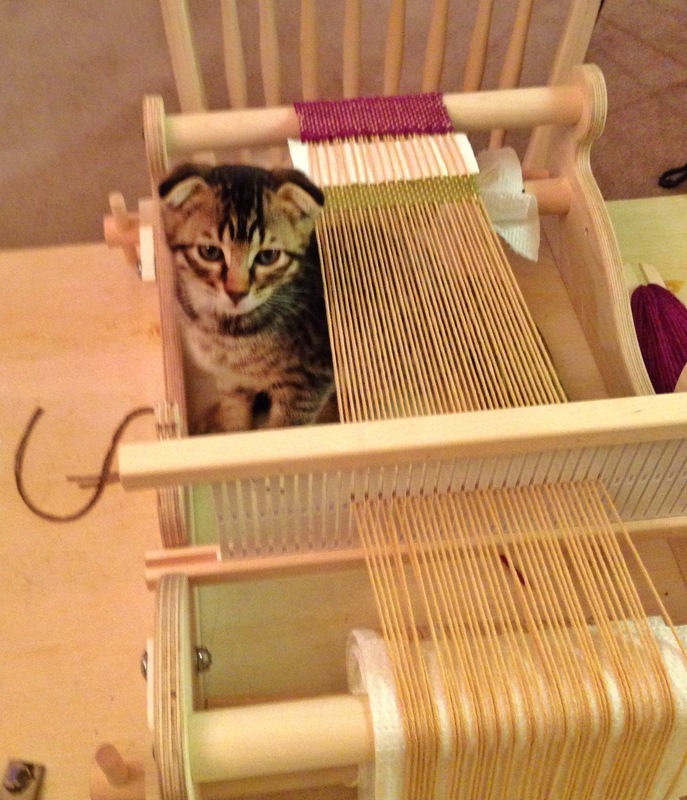 I am looking forward to the rest of the month with great anticipation as I make Christmas presents, play with my looms, start new projects, and play with my kitten! Those socks are extraordinary. Wow! And I love your bitty kitty! Happy Holidays to you, Anne, and your family including Benny! 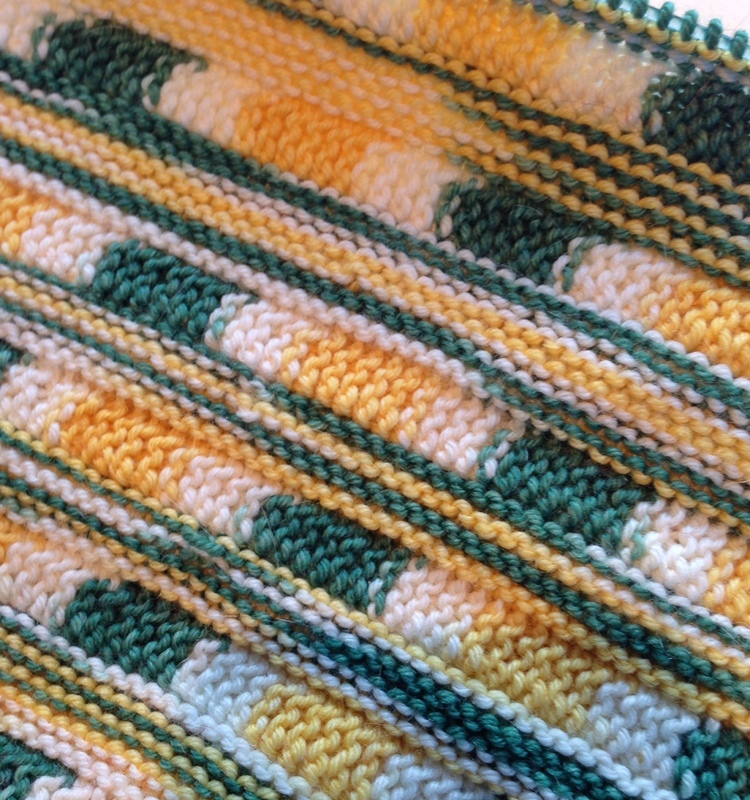 Thanks to you and Annetarsia Knits I have completed two projects utilizing the skills you taught at Stitches Midwest. The first is a sleeve for my tablet utilizing the bag pattern we worked on at Stitches and the second is a baby blanket with baby ducks for the border.